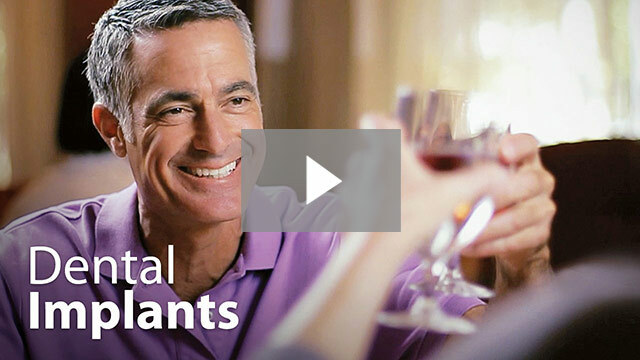 Dr. Parker explains the benefits of using dental implants to support dentures. Implants deter bone loss and stabilize dentures for a more natural look, feel and function. A dental implant is a natural looking and functioning artificial tooth that is used to replace a missing tooth. Dental implants are comprised of three parts: a titanium post that replaces the root, a crown that replaces the missing tooth, and an abutment that connects the two parts. It is placed in the jawbone and used to support a dental crown, dental bridge or a denture. We provide full dental implant services. Whether you need a single tooth replaced, or all your teeth replaced with an implant-supported restoration (bridge or dentures), we can take care of it for you in our state-of-the-art facility. Dr. Pennington has advanced training in dental implant placement and has placed thousands of implants over the last 10 years. Over the past ten years, Dr. Pennington has successfully placed thousands of dental implants for our valued patients, and has continued to hone his skills though advanced education at prestigious institutions such as the Kois Center for Excellence. In addition, Dr. Pennington has attended post-graduate courses at the world-renowned Misch International Implant Institute which provides state-of-the-art training in the art and science of implant dentistry. He uses this advanced training and his vast experience to plan and surgically insert the dental implant post(s) in a position that best reflects natural function and appearance. Implant-supported bridges provide the most lifelike multiple tooth replacement. Multiple teeth replacement: dental implants, an implant-supported denture or an implant-supported dental bridge. All teeth replaced: implant-supported removable dentures, an implant-supported fixed denture or a series of implant-supported dental bridges. Being equipped to perform the implant surgery and design restorations allows Dr. Pennington to visualize the tooth in place and plan the entire process with the end result clearly in mind. Dr. Pennington uses premium quality Astra and Camlog dental implant posts that are composed of biocompatible materials to integrate easily within your jawbone. Both posts have comprehensive scientific documentation that attests to their excellent rate of success. These dental implant posts help provide stimulation to promote healing of the bone, as well as offering optimum load distribution. As can be seen to the right of the illustration, custom abutments provide a closer fit that helps with tissue adaptation. Abutments are used to connect restorations to the implant post. Rather than choosing stock abutments, Dr. Pennington use abutments that are customized to fit your tooth socket perfectly for improved aesthetics and tissue adaptation. Dr. Pennington and Dr. Parker are both very experienced with creating custom restorations, and they carefully select the best size, shade and shape of a restoration to maintain the character of your smile. We partner with a world-class Vivedex lab, working with the same technicians, who are talented artisans, and will handcraft restorations so that they fit beautifully, look lifelike and function like a natural tooth. Dental implants are truly a modern miracle: they look, act and feel natural teeth, but are not susceptible to decay and can easily last a lifetime when placed correctly and good oral maintenance is practiced. Precision planning, CT scans and surgical guides provide Dr. Pennington with the tools to place dental implants in a minimally invasive manner that allows for less discomfort and shorter healing times. Our doctors plan each dental implant procedure in advance, ensuring precision placement. Most of the work that goes into dental implant treatment begins well before the day of your implant surgery. In fact, the majority of the process involves precise, thorough planning in advance of the surgery. Our doctors begin the procedure with a review of your current oral and overall health and comprehensive oral examination. We use both digital external and intraoral photography to gather information for planning your implant procedure. We also ask that you bring in photos of you from an earlier date if there are a significant number of teeth missing. In cases where there is insufficient bone to place an implant, we provide bone grafting. Minor bone grafting is a relatively simple procedure with a high rate of success. Should you require extractions, these can be done during the dental implant procedure. Dr. Pennington uses plasma rich in growth factors to aid with preservation of your tooth socket and accelerate healing. Surgical guides allow for precise placement of dental implants. Surgical guides provide extremely precise placement of your dental implant posts, eliminating the need for exploratory surgery. The required incisions are much smaller and healing time is reduced. To ensure your comfort during procedures we offer amenities such as warm blankets and noise-cancelling headphones, as well oral sedation. “What implant? That’s the first thing I thought when I saw the final results of my procedure. It looks like it grew up right along with my other teeth! The whole process was painless and requited no numbing after the first step of the procedure.